I spent the first 39 years of my life living for others. I lived in the myth that I could make others happy by doing what they wanted and thought was “right” for me. Then that in turn would make me happy. I crippled my own self-belief by continually searching to please others. Who did I Live For? I lived for parents growing up, especially when my brother left home and I was on my own. I lived for my husband and his family, I was the little quiet wife that says YES. I lived for my mentors and coaches, which resulted in a 6-figure business I didn’t want or love anymore. It was exhausting always trying to second guess that whey wanted from me and I never truly felt like ME. Even though they had the best of intentions and love for me, I always felt like that voice, the inner voice from your heart (some would say gut) was always pushed away. It would rise up and disagree at times, only for me to ignore it and follow what others thought was right. It wasn’t living my truth from my heart. It wasn’t being the real me. It wasn’t a life leading with love. It wasn’t being true to who I was. It wasn’t a life being confident in my own skin. And eventually I saw it was a life that would NEVER make ME happy. And I see it so many women I speak to their NEVER living for them and then get to an age and then see the truth, yet are so scared to move out of living for others for fear of what that life might be. These amazing and brave ladies, exhaust themselves in the pursuit of making others happy. Chasing other people’s dreams and putting their own family’s needs ALWAYS above their own again and again until they don’t have a clue what this is anymore. In my experience, this always leads to the same place over time, exhaustion, resentment and frustration. Today I want to help you start to change that. What I believe to be true is that the amount we judge others AND let others judge us is a reflection of how we know and feel about ourselves. If we have a strong and clear self-identity then we are more focused in our own business and less in others. If we are happy with our lives then it is unlikely that we will take the time to find fault with the way someone else looks or dresses but when we feel down on ourselves then it is so much easier to justify our own failings by picking theirs out too. So really letting go of judgment comes back to YOU, knowing and understanding YOU. Then focusing on your business rather than others and being less and less influenced by the should and could of others. The harshest form of judgment is always on ourselves. I hear it so much from my clients and my tribe, how they speak to themselves breaks my heart. There is no love or nurturing, it’s harsh, sharp and from a place of lack and dislike all too often. “I’m such an idiot. How could I have said that?”, or did you just not speak from the heart? “I’m a loser. I’ll never get anywhere,” or are you on someone else’s path. “I’m so stupid. I should have learned this by now,” or is this mistake just recorrecting your path. “I don’t fit in. I don’t belong with these people,” or they’re just not your people. “I’ll never be good enough. I’ll never do it right,” or do you just not know you? “I’m permanently emotionally damaged. I’ll never be okay,” you are okay already. “No one could love me. I’m not lovable,” or is it more about you loving you. 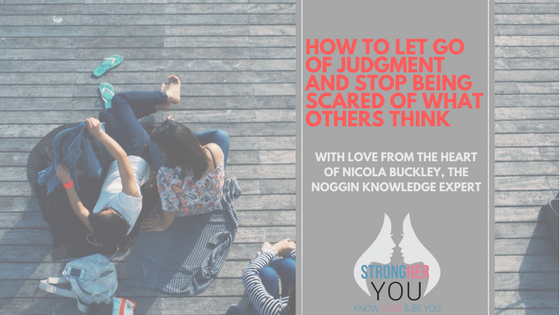 In my work with my clients I find that self-judgment is one of the major causes of fear, anger, anxiety and depression. Yet most women don’t realize that these painful feelings are the result of their own thoughts, their own self-judgments and how they see the world. Most of the time, when I ask an anxious client why they are feeling anxious, they tell me that it’s because of something that happened to them. They usually believe that an event or a person caused their anxiety. When they judge themselves or make up that I’m judging them, they get anxious. There is nothing actually happening that is causing their anxiety, other than their own thoughts. Although this is hard to accept, it also means that they can change this false reality they’ve created. I love the work of Byron Katie, and she talks about the three kinds of business we can be in. For me, the word God means “reality.” Reality is God, because it rules. Anything that’s out of my control, your control, and everyone else’s control — I call that God’s business. If you are living your life and I am mentally living your life, who is here living mine? We’re both over there. Being mentally in your business keeps me from being present in my own. I am separate from myself, wondering why my life doesn’t work. Do I know what’s right for me? So, my invitation, the next time you’re feeling stress or discomfort, ask yourself whose business you’re in mentally, and you may have a lightbulb moment. That question can bring you back to yourself. When you’re being in your business use that time to really uncover your own self-identity. It’s like joining up the dots in your life and you’ll learn to be … well YOU. Become the world leading authority in YOU, the leading expert in this universe on who you are and what you want. If you don’t know one else will. What are your VALUES … Let these lead your life, be your true compass. What are your BELIEFS … Do these serve you? Do they need upgrading? What and who you LOVE … do more of it, let that LEAD your diary. What you don’t LOVE … Do less or STOP it. Start to put yourself first, if that’s too hard start to at least put yourself on the list and above the cat! Start to spend time and commit to honouring yourself by having some simple pleasures booked in your diary and stick to them. Add some time for you to your diary and invest in your dates with yourself. Your diary is a reflection of your life and if you aren’t happy then something needs to change in it. What weekly love bombs can you add to your diary? *Lovebombs are small things you love to remind yourself of who you are, feel good things that make you smile and your heart feel happy. We all have a right to say, think, feel and do what we want, it’s part of being human. So even though someone might not agree with your views, allow them the room to be who they are and in return let yourself be you. If you don’t feel good round them and you don’t agree with who they are, it might be that they’re not your people right now. And that’s okay, people come into our lives at times to show us something about ourselves. Let them have their view and learn what it means for you and your life. You don’t know their view of the world, their experiences and what affect that has had on them. So the simplest way is by coming back to you and being in your own business, let others be who they are too. And it’s my belief, everyone one is doing the best they can … they’re not out to hurt you or put you down. The car that cut you up, the unsmiling face on the Tube, the friend who could only take about their troubles, your children playing you up … they’re doing their best. Ready for the Noggin Knowledge? So, there is a part of the brain that is only focused on social connection and where you stand in the social hierarchy, it’s called the mammalian brain. It looks for connection, care and love … where do I fit? And it’s physically bigger in women, so we’re hardwired to care more about what people think of us. That leads to us worrying about, he said and she said etc. So, what to do about this? Be YOU, if we’re all continually subconsciously judging each other then it holds true for that you might aswell be judged for doing what you love and being YOU. I invite you to be the YOUiest version of YOU, in all your perfectly imperfect glory. SIMPLES but not easy. 1. 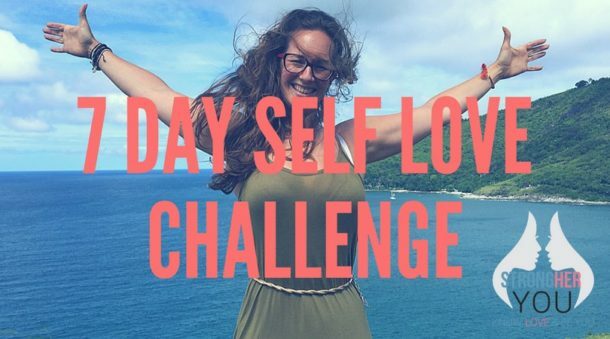 Register for this private training … The 7 Day StrongHer Self Love Challenge is a great start point with a short challenge for each day that you can do when it suits you. Over 250 women have now been through this 7 Day Kickstart to knowing and loving themselves, with results as varied as they were AMAZING. CLICK HERE. 2. Join the StrongHer Revolution free group of amazing women who are starting to put themselves first and get to know who they are and what they want. It’s the StrongHer Facebook family where busy, successful women learn to at last know themselves and create a life they love. CLICK HERE. 3. Join our StrongHer Revolution Programme. Over 125 women in the last year have now gone through my beloved group programme, with HUGE changes in their lives and how they feel about themselves. Between them they’ve found more clarity, belief and confidence to make HUGE courageous changes in their lives. To create new businesses, change careers, leave or start relationships, moved countries, taken up lifelong passions and there’s even been a wedding and a baby. Would you like to be the next StrongHer Success story? Join the wait list here. 4. Work with me and my team privately. If you’d like to have some closer support, my latest thinking and weekly nudges from yours truly to take you from where you are now to having clarity, confidence and belief. Join my limited group of incredible VIP clients to take you from being lost and confused to living a truly happy life and be confident in your own skin. Find out more here.